The BMW 5 Series Range: New Diversity Extends Leadership on Efficiency and Driving Enjoyment. Further highly efficient engines, more standard-fitted BMW EfficientDynamics measures and attractive additions to the optional equipment range reaffirm the BMW 5 Series’ benchmark position on efficiency and driving enjoyment at the premium end of the upper mid-range segment. From autumn 2011, both the BMW 5 Series Sedan and the BMW 5 Series Touring ranges will for the first time feature two newly developed four-cylinder petrol engines with BMW TwinPower Turbo technology. More diesel engines will get this technology too. Also from autumn, the BMW 5 Series Touring line-up will be joined by a new top-of-the-line model, the BMW 550i Touring with V8 engine. All these measure will help the BMW 5 Series extend its segment leadership as the model range with the best balance of driving enjoyment and fuel economy. The most fuel-efficient model of all is the BMW 520d EfficientDynamics Edition, which achieves average fuel consumption in the EU test cycle of 4.5 litres per 100 km (62.7 mpg imp) and CO2 emissions of 119 grams per kilometre. From autumn 2011, a Driving Experience Control switch will be standard specification on the BMW 5 Series Sedan and the BMW 5 Series Touring. On all four- and six-cylinder models, this switch also allows the driver to select ECO PRO mode. At the same time, further model versions will be fitted with the Auto Start-Stop function as standard. New optional equipment features will include innovative functions from BMW ConnectedDrive, including the new-generation BMW Head-Up Display, Real-Time Traffic Information and hands-free opening of the tailgate or rear window. 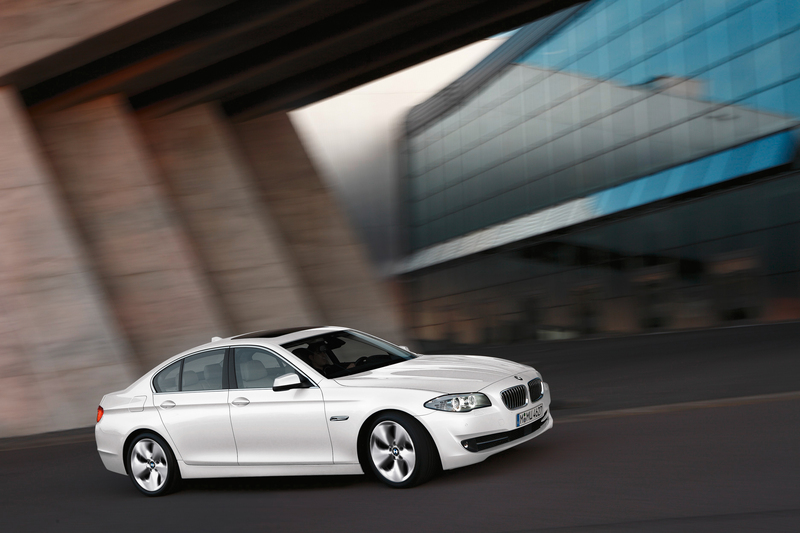 The BMW 5 Series is also confirming its position as a safety leader with the new Active Protection function. Autumn 2011 will also see the launch of an M Sport package for the BMW 5 Series Gran Turismo, which was developed specifically for this model. New options from the BMW Individual range for this model, comprising additional exterior paint finishes, alloy wheels and interior trim, all highlight the exclusive character of the BMW 5 Series Gran Turismo. New four-cylinder petrol engines with BMW TwinPower Turbo technology. With the launch of a new generation of four-cylinder engines with BMW TwinPower Turbo technology, the BMW 5 Series engines for the upper mid-range market now lead the way on efficiency and sporty power delivery in the petrol segment too. This world-exclusive technology equips the two 2.0-litre engines with twin-scroll turbocharging, High Precision Injection direct injection, VALVETRONIC variable valve timing and Double-Vanos variable camshaft timing. This combination of features is inspired by the technology package used on the multi-award-winning 225 kW/306 hp six-cylinder in-line BMW TwinPower Turbo engine of the BMW 535i. Now BMW has adopted this highly efficient performance-boosting technology in the four-cylinder engines as well. The system, which delivers the exhaust gases from each pair of cylinders to the turbine via two separate channels, both in the exhaust manifold and in the turbocharger itself, provides more responsive performance. The fuel supply is precisely metered by the direct-injection system with solenoid injectors, while the latest version of the VALVETRONIC system provides even more precise air mass control and, in combination with Double-Vanos variable intake and exhaust camshaft timing, optimises both efficiency and response. As fitted in the new BMW 520i, the four-cylinder engine develops maximum power of 135 kW/184 hp at 5, 000 rpm and peak torque of 270 Newton metres (199 lb-ft), which is available between 1,250 and 4,500 rpm. Instantaneous power response helps the BMW 520i Sedan perform the 0 to 100 km/h (62 mph) sprint in 7.9 seconds (automatic: 8.0 seconds), while the BMW 520i Touring accomplishes the same task in 8.3 seconds (automatic: 8.4 seconds). Top speeds are 227 km/h (141 mph) (automatic: 226 km/h / 140.4 mph) for the Sedan and 220 km/h (36.7 mph) (manual and automatic) for the Touring model. Simultaneous efficiency improvements are reflected in average fuel consumption (as per EU test cycle, depending on tyre format) of 6.8 – 7.0 l/100 km (40.3 – 41.5 mpg imp) (automatic: 6.5 – 6.7 litres / 42.2 – 43.5 mpg imp) and CO2 emissions of 157 – 163 grams (149 – 155 grams) per kilometre. For the BMW 520i Touring, the corresponding figures are 7.0 – 7.3 l/100 km (38.7 – 42.2 mpg imp) (automatic: 6.7 – 7.0 litres / 40.3 – 42.2 mpg imp) and 163 – 170 grams (automatic: 156 – 163 grams) per kilometre. In the new BMW 528i, with modified turbocharging and injection technology, the four-cylinder engine develops maximum power of 180 kW/245 hp at 5,000 through 6,500 rpm, and peak torque of 350 Newton metres (258 lb-ft), which is available between 1,250 and 4,800 rpm. 0 to 100 km/h (62 mph) is accomplished in 6.2 seconds for the new BMW 528i Sedan (automatic: 6.3 seconds), and 6.4 seconds for the BMW 528i Touring (automatic: 6.6 seconds). Top speeds are 250 km/h (155 mph) for the Sedan and 244 km/h (151.6 mph) for the Touring model (in both cases the figures are the same for both manual and automatic versions). The new BMW 528i Sedan achieves average fuel consumption (as per EU test cycle, depending on tyre format) of 6.8 – 7.1 l/100 km (39.8 – 41.5 mpg imp) (automatic: 6.5 – 6.8 litres / 41.5 – 43.5 mpg imp), and CO2 emissions of 159 – 165 grams (automatic: 152 – 158 grams) per kilometre. For the new BMW 528i Touring, the corresponding figures are 7.1 – 7.4 l/100 km (38.3 – 39.8 mpg imp) (automatic: 6.8 – 7.1 litres / 39.8 – 41.5 mpg imp) and 165 – 172 grams (automatic: 159 – 166 grams) per kilometre. BMW 520d EfficientDynamics Edition: unique in the upper mid-range segment – a premium sedan with CO2 emissions of 119 g/km. From autumn 2011, in parallel with the regular BMW 520d, an ultra-fuel-efficient version of this sedan will be offered: the BMW 520d EfficientDynamics Edition. With unchanged maximum power (135 kW/184 hp) and torque (380 Newton metres / 280 lb-ft), this model records average fuel consumption in the EU test cycle of 4.5 l/100 km (62.8 mpg imp) and CO2 emissions of 119 grams per kilometre. This is around ten per cent better consumption than the most fuel-efficient segment competitors, despite the fact that the BMW 520d EfficientDynamics Edition is more powerful than the competitor models. With a 0-100 km/h (62 mph) acceleration time of 8.2 seconds and a top speed of 231 km/h (143.5 mph), even this most fuel-efficient model in the BMW 5 Series boasts typical sporty BMW performance. Its extra-efficient 2.0-litre diesel engine is, like that of the familiar BMW 520d, equipped with a centrifugal pendulum absorber which reduces irregular running at low engine speeds for greater refinement. It is also combined with a range of other efficiency-enhancing measures. These include Auto Start-Stop, an Optimum Shift Indicator, Brake Energy Regeneration and active cooling flap control, plus a longer final drive ratio and special aero rims with “Streamline” styling. New diesel engines for the BMW 5 Series: more power and efficiency, courtesy of BMW TwinPower Turbo technology. For the other diesel engines in the BMW 5 Series, autumn 2011 will bring further improvements in power, and further reductions in fuel consumption, in line with the twofold goal of BMW EfficientDynamics. The BMW 525d will get a new four-cylinder diesel engine with BMW TwinPower Turbo technology. This 2.0-litre all-aluminium unit features Variable Twin Turbo two-stage turbocharging and common-rail diesel injection with piezoelectric injectors. The new unit features reduced weight and, thanks to the VNT technology of the small turbocharger, instantaneous response. The small turbocharger comes on stream at low engine speeds, while the contribution from the larger turbocharger varies in precise response to throttle requirements. The new BMW 525d offers a 10 kW power increase over the previous model, developing 160 kW/218 hp at 4 ,400 rpm. Peak torque of 450 Newton metres (332 lb-ft) is now available between 1,500 and 2,500 rpm. The extra agility and sprinting power is reflected in a further improvement in 0-100 km/h (62 mph) acceleration times, which now stand at 7.0 seconds for the Sedan and 7.2 seconds for the Touring model. Top speeds are 243 km/h (150.9 mph) (automatic: 239 km/h / 148.5 mph) for the new BMW 525d Sedan and 236 km/h (146.6 mph) (automatic: 233 km/h / 144.8 mph) for the BMW 525d Touring. 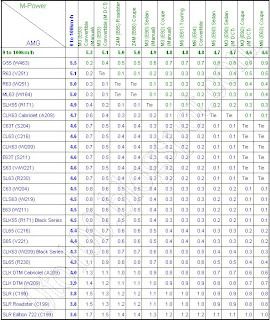 Average fuel consumption (as per EU test cycle, depending on tyre format) is 5.0 – 5.3 l/100 km (51.4 – 53.3 mpg imp) (automatic: 4.8 – 5.0 litres / 56.5 – 58.8 mpg imp) for the Sedan and 5.3 – 5.5 litres (51.4 – 53.3 mpg imp) (automatic: 5.1 – 5.4 litres / 52.3 – 55.4 mpg imp) for the Touring model – a 20 per cent reduction over the previous models. The corresponding CO2 emissions are 132 – 138 grams (automatic: 126 – 132 grams) per kilometre for the Sedan and 138 – 145 grams (automatic: 135 – 142 grams) for the Touring model. The new 5 Series in-line six-cylinder diesel engines with BMW TwinPower Turbo due for launch in autumn 2011 again offer more power and a further reduction in fuel consumption and emissions. Extensive modifications to the 3.0-litre engine in the new BMW 530d results in a 10 kW power increase to 190 kW/258 hp at 4,000 rpm. Equipped with VNT turbocharging and common-rail injection with solenoid injectors, its peak torque of 540 Newton metres (398 lb-ft) (560 Nm / 413 lb-ft) with automatic transmission) is on stream between 1,500 and 3,000 rpm. The BMW 530d Sedan and Touring models accelerate from 0 to 100 km/h (62 mph) in 6.1 and 6.2 seconds respectively (automatic: 6.0 and 6.1 seconds). The Sedan has a governed top speed of 250 km/h (155 mph), while the Touring model tops out at 247 km/h (153.5 mph) (automatic: 248 km/h / 154.1 mph). Average fuel consumption (as per EU test cycle, depending on tyre format) has been reduced by approximately 13 per cent compared with the previous models, to 5.7 – 5.9 l/100 km (47.9 – 49.6 mpg imp) (automatic: 5.3 – 5.5 litres / 51.4 – 53.3 mpg imp) for the Sedan and 5.9 – 6.2 litres (45.6 – 47.9 mpg imp) (automatic: 5.5 – 5.8 litres / 48.7 – 51.4 mpg imp) for the Touring model. CO2 emissions are 149 – 155 grams (automatic: 139 – 145 grams) per kilometre for the BMW 530d Sedan and 155 – 162 grams (automatic: 145 – 152 grams) per km for the BMW 530d Touring. Moving on to the BMW 535d, the world’s sportiest six-cylinder diesel engine offers further gains in performance and efficiency. The new version of the BMW 535d’s 3.0-litre engine features a modified two-stage Variable Twin Turbo system and common-rail injection with piezoelectric injectors. These modifications increase maximum power to 230 kW/313 hp at 4,400 rpm, and deliver peak torque of 630 Newton metres (465 lb-ft) at between 1,500 and 2,500 rpm. The awesome torque accelerates the BMW 535d – which is standard-equipped with an eight-speed automatic transmission – from 0 to 100 km/h (62 mph) in 5.5 seconds. These times are identical for both the Sedan and the Touring model. Both models have a governed top speed of 250 km/h (155 mph). Equally impressive are an average fuel consumption (as per EU test cycle, depending on tyre format) of 5.4 – 5.6 l/100 km (50.4 – 52.3 mpg imp) (Touring: 5.6 – 5.9 litres / 47.9 – 50.4 mpg imp) and CO2 emissions of 142 – 148 grams (148 – 155 grams) per kilometre. BMW 5 Series Sedan: international bestseller is now even more attractive. The BMW 5 Series Sedan is a worldwide success. It has won a host of awards and comparison tests and earned top marks on quality, safety and value retention. Demand in car markets all over the world is steadily growing. With its seductive styling, its unrivalled balance between sporty performance and comfort, and an extensive range of innovative equipment features, this series quickly established itself as the world market leader in its segment. Now, new engine versions and specification upgrades will lend this model range even greater variety and appeal. 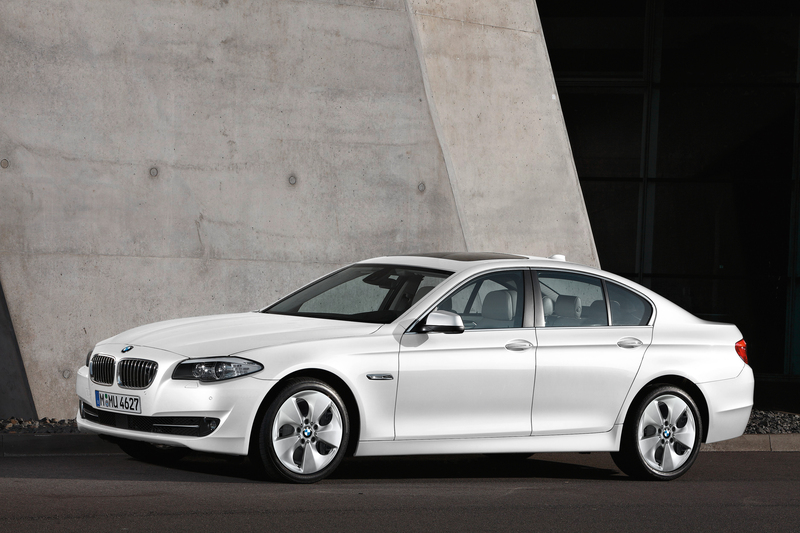 From autumn 2011, the BMW 5 Series Sedan range will consist of five petrol and four diesel models. The petrol versions comprise the two new four-cylinder models, the six-cylinder in-line BMW 530i with lean-burn High Precision Injection, whose output has been upgraded to 200 kW/272 hp, the BMW 535i, and the range-topping V8 BMW 550i. The diesel versions comprise two four- and two six-cylinder units. At the same time, further xDrive versions will be offered. This intelligent all-wheel-drive system, which provides optimised driving dynamics, traction and stability, will in future be fitted in the BMW 528i xDrive, BMW 535i xDrive, BMW 550i xDrive, BMW 525d xDrive, BMW 530d xDrive and BMW 535d xDrive. BMW 5 Series Touring: the perfect combination of attractive styling, dynamism and adaptability. The BMW 5 Series Touring range, too, now offers even more choice. From autumn 2011 this model range, which provides the world’s most attractive combination of driving enjoyment, adaptability and upscale styling, will likewise be available in nine different engine versions. The new top-of- the-range model will be the BMW 550i Touring, whose V8 engine with BMW TwinPower Turbo technology develops maximum power of 300 kW/407 hp and peak torque of 600 Newton metres (442 lb-ft). A 0-100 km/h (62 mph) sprint time of 5.1 seconds puts this model on a par with top-class sports cars. Average fuel consumption (as per EU test cycle, depending on tyre format) is 10.7 litres/100 km (26.4 mpg imp), with CO2 emissions of 249 – 250 grams per kilometre. At the same time, with its high standards of long-distance ride comfort and its adaptable load space, the BMW 5 Series Touring is the epitome of an ideal touring vehicle. With the rear backrest partially or fully lowered, using the levers in the luggage compartment, load space can be increased from 560 to as much as 1,670 litres. For even bigger transport jobs, a trailer hitch with a towing capacity of two tonnes is available. To add another dimension to the driving enjoyment, and to provide even more confidence and control when towing a trailer, xDrive intelligent all-wheel-drive versions are also available. This system, which electronically controls the drive power distribution, will be available from autumn 2011 in the BMW 528i xDrive Touring, BMW 535i xDrive Touring, BMW 525d xDrive Touring, BMW 530d xDrive Touring and BMW 535d xDrive Touring. Auto Start-Stop function and Driving Experience Control including ECO PRO mode set new standards of efficiency. From autumn 2011, a Driving Experience Control switch will be fitted as standard on the BMW 5 Series Sedan and BMW 5 Series Touring models. This rocker switch on the centre console allows the driver to customise accelerator response characteristics, engine response, the power steering characteristics, the Dynamic Stability Control (DSC) thresholds and, on automatic models, the shift characteristics of the transmission. Drivers can choose between “COMFORT”, “SPORT” or “SPORT+” modes. All the four- and six-cylinder models also feature ECO PRO mode, which supports a relaxed, extra-fuel-efficient, low-rpm driving style. At the same time, ECO PRO mode also programs electrically powered convenience functions like the heated seats and exterior mirrors and the air conditioning to operate at optimum efficiency. A special display in the instrument cluster lets the driver know by how much the driving range is being extended when using ECO PRO mode (see chapter 2.6: BMW EfficientDynamics). Auto Start-Stop, which from autumn 2011 will be specified as standard on even more BMW 5 Series models, makes another big contribution to efficiency. This system, which automatically shuts the engine off when the vehicle is stopped in a traffic queue or at intersections, can be used on both manual and automatic models. In future it will form part of the BMW EfficientDynamics technology package on all diesel models as well as on the BMW 520i, BMW 528i and BMW 535i. On the BMW 535i, the Auto Start-Stop function in combination with an optimised drive train cuts fuel consumption by up to 9 per cent despite a further improvement in performance, while the Sedan and Touring versions now both achieve a 0 to 100 km/h (62 mph) time of 5.8 seconds (automatic: 5.9 seconds). The average fuel consumption of the BMW 535i Sedan (as per EU test cycle, depending on tyre format) has been improved to 8.1 – 8.3 l/100 km (34 – 34.9 mpg imp) (automatic: 7.6 – 7.9 litres / 35.8 – 37.2 mpg imp), and CO2 emissions to 188 – 194 grams per kilometre (automatic: 177 – 183 grams), while the BMW 535i Touring achieves an average of 8.2 – 8.5 l/100 km (33.2 – 34.4 mpg imp) (automatic: 7.7 – 8.0 litres / 35.3 – 30.5 mpg imp) and CO2 emissions of 190 – 197 grams per kilometre (automatic: 179 – 186 grams). Enhanced safety, comfort and infotainment with new BMW ConnectedDrive functions. The BMW 5 Series leads its segment in another important area too: active and passive safety. Euro NCAP, US NCAP and the Australasian NCAP are among the crash tests in which the 5 Series Sedan achieved the maximum rating of five stars. From autumn 2011, the range of safety equipment will be extended to include the innovative Active Protection system. If an accident risk is detected, the central safety electronics will automatically close the side windows and the sunroof (if fitted). At the same time, the front seatbelts are pre-tensioned and, if the optional comfort seats are fitted, their backrests are adjusted to an upright position. In this way the Active Protection system helps to mitigate the risk of occupant injuries. Elsewhere, the optional Comfort Access system has been upgraded with a new function – the hands-free tailgate opener, which provides increased convenience when loading the luggage compartment of both the Sedan and the Touring model. 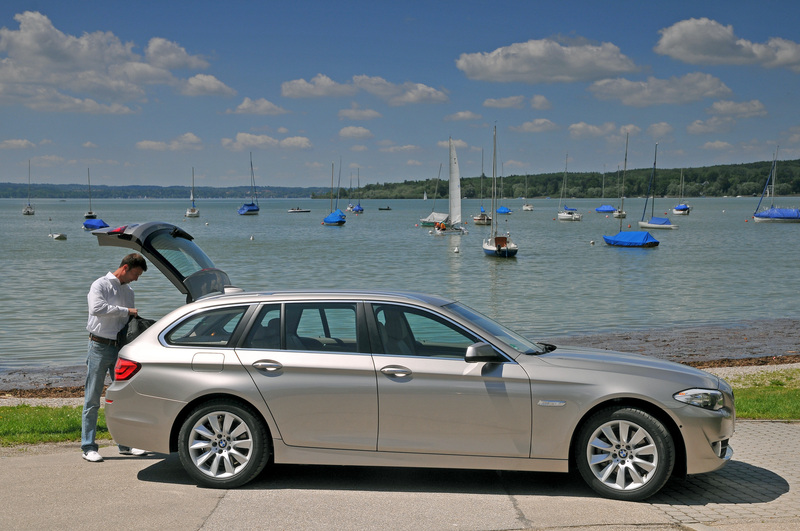 This innovative function allows drivers to open the boot or tailgate automatically simply by moving their foot under the rear apron (see chapter 2.7: BMW ConnectedDrive). On the BMW 5 Series Touring, this opens and raises either the independently opening tailgate window or, if the optional electric opening and closing function is fitted, the entire tailgate. In future, 5 Series models with the optional Professional navigation system will also be available with Real-Time Traffic Information. This new BMW ConnectedDrive function provides drivers with more precise and more up-to-date information about traffic conditions on motorways and main roads, and on selected urban roads (see chapter 2.7: BMW ConnectedDrive). A further innovative system that improves driver concentration, and ultimately safety, is the optional BMW Head-Up-Display. This system projects relevant information onto the windscreen directly in the driver’s line of sight. From autumn 2011, the BMW 5 Series Sedan, the BMW 5 Series Touring and the BMW 5 Series Gran Turismo will be available with the new-generation version of the BMW Head-Up-Display, which for the first time offers full-colour display of symbols and graphics, making road signs etc. look even more realistic. The functionality of the optional BMW Night Vision system with pedestrian recognition has now been extended to include an acute warning comprising visual and audible signals. 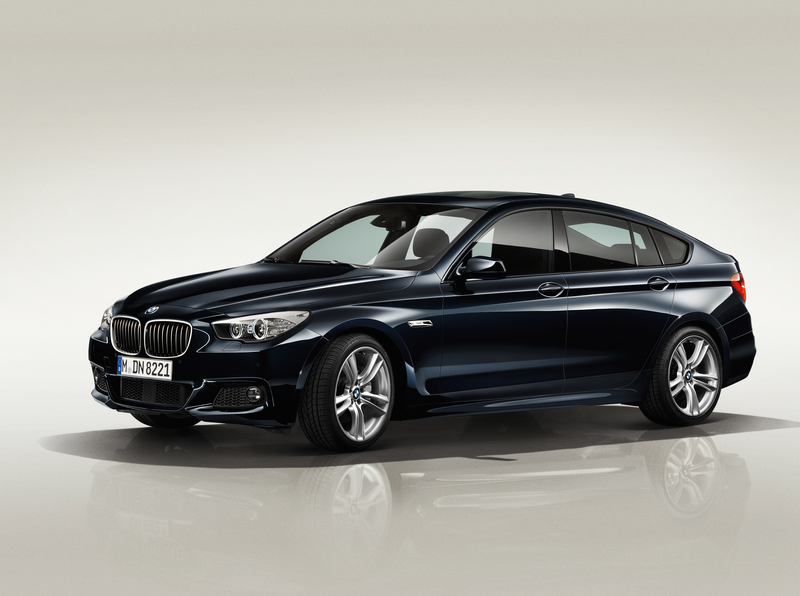 BMW 5 Series Gran Turismo: more sporty and exclusive than ever. The BMW 5 Series Gran Turismo provides a unique blend of adaptability, touring comfort and effortless driving enjoyment. From autumn 2011, it will for the first time be available with an M Sport package which accentuates and intensifies the most dynamic facets of this model. The package comprises a range of aerodynamics, suspension and interior components which were developed specifically for this model and which heighten both the sporty driving qualities and the brawny appearance of the BMW 5 Series Gran Turismo. The specification includes an M aerodynamics package, dark chrome tailpipes, lowered M Sport suspension and 19-inch V-spoke M alloy wheels with mixed tyres. Alternatively, 20-inch twin-spoke M alloy wheels with mixed tyres are available as an option. A typical M feel in the interior is provided by sports seats upholstered in fabric/alcantara (Dakota leather for the BMW 550i Gran Turismo), an M leather steering wheel, M driver’s footrest, M door sill finishers, Palladium Grey interior trim strips and a BMW Individual roof lining in anthracite. In conjunction with the M Sport package, seven exterior paint finishes are available for the BMW 5 Series Gran Turismo, including M-exclusive Carbon Black metallic. In addition to the regular optional equipment list for the BMW 5 Series Gran Turismo, various exclusive options from the BMW Individual range are also available. Four more BMW Individual paint colours will be on offer in future. These will include the BMW Individual exterior paint finishes Citrin Black metallic, Champagne Quartz metallic, matt-finish Frozen Grey metallic and matt-finish Frozen Silver metallic. Also new in the BMW Individual range for this model will be 20-inch V-spoke alloy wheels with mixed tyres. In conjunction with the optional comfort seats, the extended BMW Individual Merino leather trim will be available in Platinum/Black and Amaro Brown/Black. The exclusive appearance of the seats, both at the front and at the rear, is finished off by contrasting piping. Matching leather BMW Individual interior trim strips in Platinum/Black and Amaro Brown/Black are also available. The stylish and exclusive ambience can be topped off with BMW Individual door sill finishers and a BMW Individual rear badge.